The brown-headed barbet (Psilopogon zeylanicus) is an Asian barbet belonging to the family Megalaimidae. 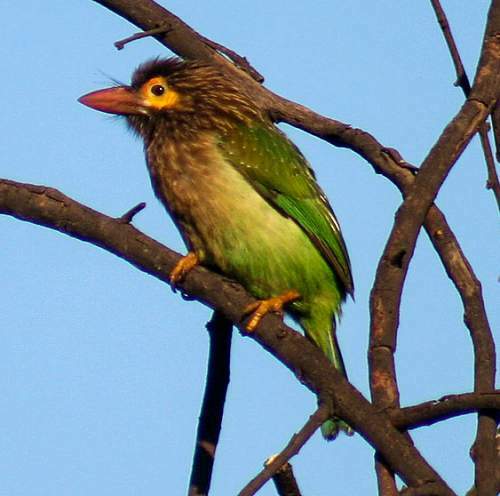 The brown-headed barbet species are distributed in India, Nepal and Sri Lanka. These barbet species were considered conspecific with Psilopogon lineatus. These barbets are polytypic species. The brown-headed barbet (Psilopogon zeylanicus) is a large Asian barbet, measuring 25 to 30 cm in length and weighing 100 to 140 grams. The overall plumage of these brown-headed barbets is green. The upperparts, wings and tail are green. The head, throat, neck and breast are brownish. There are prominent pale streaks on head, mantle and breast. The rest of the underparts are pale green. The bill is thick and is pinkish red. There is a large yellowish orange eye patch surrounding the eyes. The irises are blackish. The feet are grayish yellow. Both the sexes appear similar and the juveniles have duller plumage. The brown-headed barbet call consists of trilling, twice repeated “po-kok” or a repetitive kutroo…kutroo" sound. The brown-headed barbet species are distributed in India, Nepal and Sri Lanka. In India, these species are distributed in the states of Jammu and Kashmir, Himachal Pradesh, Punjab, Haryana, Uttarakhand, Uttar Pradesh, Rajasthan, Gujarat, Madhya Pradesh, Chhattisgarh, Bihar, Jharkhand, West Bengal, Odisha, Telangana, Maharashtra, Andhra Pradesh, Karnataka, Goa, Tamil Nadu and Kerala. The brown-headed barbet nominate subspecies P. z. zeylanicus is distributed in southern India (Kerala and south Tamil Nadu) and Sri Lanka. The subspecies P. z. inornatus is distributed in central and southwest India (Maharashtra, Goa and Karnataka). The subspecies P. z. caniceps is distributed in central and north India (Jammu and Kashmir, Himachal Pradesh, Punjab, Haryana, Uttarakhand, Uttar Pradesh, Rajasthan, Gujarat, north Maharashtra Madhya Pradesh, Chhattisgarh, Bihar, Jharkhand, West Bengal, Odisha, Telangana and Andhra Pradesh) and Nepal. The Important Bird and Biodiversity Areas (IBA) of the brown-headed barbet in Nepal are, Sukla Phanta Wildlife Reserve, Barandabhar forests and wetlands, Dharan forests, Bardia National Park and Chitwan National Park. These brown-headed barbet species have moderate forest dependence. The artificial ecosystems of these brown-headed barbet species include orchards, plantations, agricultural fields, rural gardens and urban areas. The natural ecosystems of these brown-headed barbet species include tropical and subtropical dry forests, wooded country, tropical and subtropical moist lowland forests, deciduous woods and tropical and subtropical moist shrublands. The diet of the brown-headed barbet consists mainly of fruits. A variety of wild fruits, figs, drupes, berries, cultivated garden fruits and vegetables and plantation fruits are their primary food. The figs from the Ficus spp. is the important food item of these birds. They are known to raid coffee plantations and orchards causing considerable damage to the produce. The brown-headed barbets are also known to glean insects such as ants, termites, cicadas, grasshoppers, dragonflies, mantids, crickets, locusts, centipedes, beetles and moths from the branches and trunks of trees. 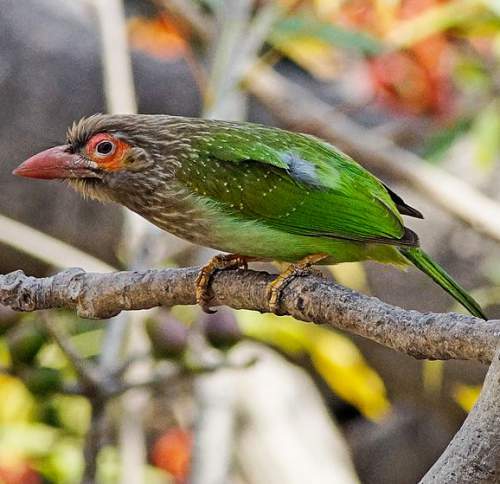 The breeding season of the brown-headed barbet species is from February to October. These birds are monogamous. Their nesting sites are tree cavities. Both the adults excavate the nesting hole. The clutch may contain 2-4 eggs. Both the parents take turn to incubate the eggs and care the hatchlings. The chick hatch out after 13 days. The brown-headed barbet species are non-migratory resident birds. Birds in higher elevations may move to lower levels and plains in winter. The global population size of the brown-headed barbet (Psilopogon zeylanicus) has not been quantified. The overall population trend of these species is reported to be stable. Throughout its range this barbet species is reported to be locally common to fairly common. The generation length is 8.5 years. Its distribution size is about 3,120,000 sq.km. Habitat degradation and fragmentation, hunting and capture of adults and juveniles for pet trade are the main threats that may endanger the survival of these species. The brown-headed barbet (Psilopogon zeylanicus) does not approach the thresholds for being Vulnerable, either under the range size criterion, or under the population trend criterion or under the population size criterion. The IUCN (International Union for Conservation of Nature) has categorized and evaluated the species and has listed it as of "Least Concern". The CITES (Convention on International Trade in Endangered Species of Wild Fauna and Flora) status is ‘Not Evaluated’ for brown-headed barbet (Psilopogon zeylanicus). The brown-headed barbet (Psilopogon zeylanicus) is closely related to the lineated barbet (Psilopogon lineatus), green-eared barbet (Psilopogon faiostrictus) and white-cheeked barbet (Psilopogon viridis). The three recognized subspecies of the brown-headed barbet (Psilopogon zeylanicus) are: Psilopogon zeylanicus zeylanicus (J. F. Gmelin, 1788), Psilopogon zeylanicus inornatus (Walden, 1870) and Psilopogon zeylanicus caniceps (Franklin, 1831). Current topic in Birds of India: Brown-headed barbet - Psilopogon zeylanicus.